Having the best backpacking axe with you on your outdoor excursions can make life easier both on the trail and when it comes time to set up camp. We researched some of the best products available and put together this guide to help you find the right tool for you to take on your next adventure. Before we get into our products, let’s take a look at some of the things to keep in mind when you’re shopping. Length: This is the measurement from the top of the axe to the end of the handle. As you’ll see, it varies quite a lot so, whether you want something small or something more substantial, there’s an axe here for you. Grip Material: Grips are made of a few different materials, including rubber, wood, leather, and plastic. Some of these are better in wet weather than others. If you backpack somewhere that’s wet a lot of the time, keep that in mind. Blade Length: Blade lengths actually don’t vary that much from product to product. For backpacking axes, standard length is anywhere from 3 to 4 inches. We did find one that was a little bigger with a length of 4.5 inches. Sheath Included: It’s important to put a sheath on the blade when it’s not in use. This not only protects you from any accidents, it also keeps the blade safe from the elements and will help maintain a sharp edge longer. Blade Material: These blades are all made of some form of steel. Some are stainless steel, some are coated. There are forged steel blades and high carbon ones, too. Steel itself is a great choice because it’s strong and really durable. Warranty: As with most things, these warranties vary widely. We were impressed by how many of these brands provide lifetime warranties but there are also some that only cover a year or don’t come with any warranty at all. Now that you know a little more about what to look for, let’s move into the next section of our backpacking axe buying guide, our reviews. Here’s the deal, we put our top and budget picks first. That way, you’ll be able to get a good idea of the range that’s available if you’re in a hurry. Have time to stick around? Keep reading, these axes are all unique and each one has something special to offer. Okay, let’s go! Our top pick for backpacking axe is the Estwing Sportsman’s Axe. It comes with a lifetime warranty and for good reason because it was designed to last a lifetime. One of the things that makes it so durable it that it’s forged from one piece of hand polished American steel. The handle is made of genuine leather that’s been hand sanded and lacquered to add even more durability. Putting it simply, this axe just looks like a fine-crafted tool. 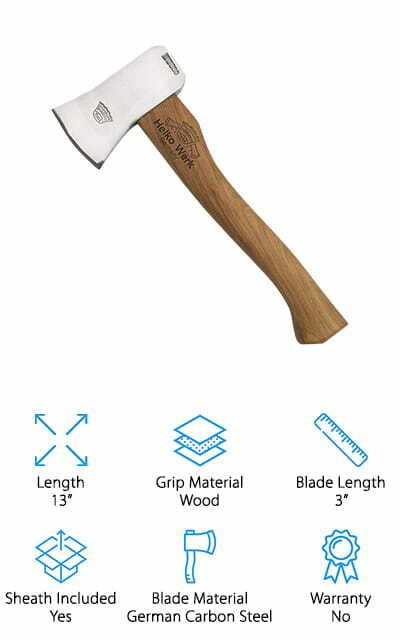 But don’t let its good looks fool you, it’s also the perfect axe for any outdoor application, from chopping large logs to splitting kindling. You can even use it to split bone when processing meat during hunting season. It includes a heavy duty nylon sheath to protect the blade when not in use. Our budget pick is the best cheap backpacking axe around, the WatchFire Camper’s Hatchet. It small and lightweight which makes it easy to carry in your pack on long journeys. The blade is made of stainless steel that’s been coated for extra protection and durability. It has a skid proof handle that’s easy to grip and hold onto. Also included is a nylon sheath to protect the blade when not in use. 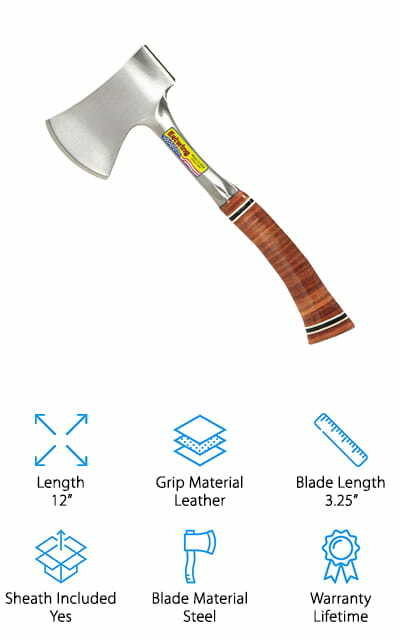 This hatchet was meant for light applications, like cutting small branches or kindling. It’s also perfect for tearing into the ground to build a fire pit. Another great thing about this axe is that it holds its edge really well. Yes4All Camping Axe is our pick for best survival axe because it has all you need for a weekend getaway under the stars. The stainless steel blade has a black coating for extra protection from the elements and additional rust resistance. It’s great for chopping firewood and can even be used to elicit sparks from the included magnesium fire starter stick. It comes with a hard molded plastic case that has both a handle and a loop to attach to your belt so you can make sure it’s always with you when you need it. And get this, inside the handle is a 12” saw knife. 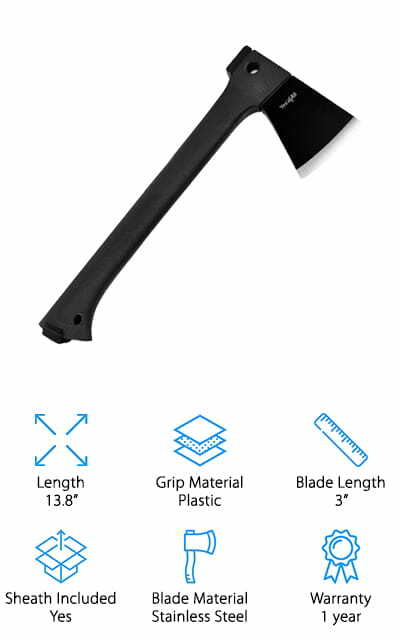 Speaking of the handle, it’s wrapped in durable plastic and has a great grip so you can use this axe confidently, even in wet weather. 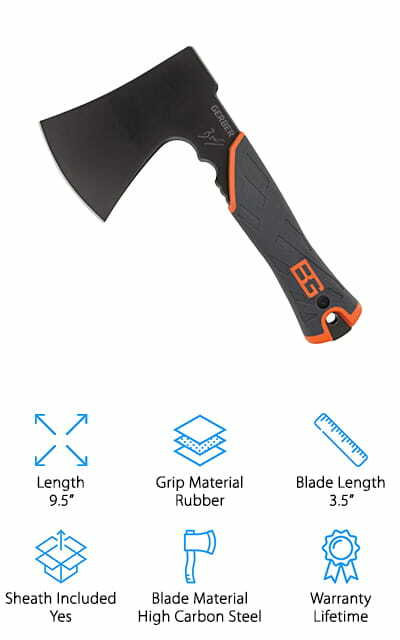 Another great choice for a camping axe comes from Schrade. 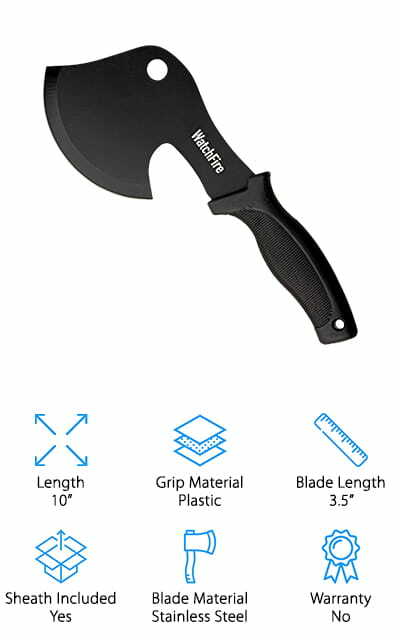 This hatchet has a durable stainless steel blade that’s been powder coated for additional protection from rust and added durability. On the back end of the blade is a hammer pommel, ideal for pounding in tent stakes or anything else you need it for when you’re out in the woods. The black rubber handle has finger grooves and a grip that resemble tire tread so you can swing it confidently even in wet, rainy conditions. It’s ergonomically designed and really comfortable to use, even for long periods of chopping firewood. The protective sheath has belt loops that keep this axe always by your side. There’s also a lanyard hole in the bottom of the handle if you would rather carry it that way. Next up is our pick for best wood splitting axe, Estwing’s Camper’s Axe. What makes this so good for wood? For one thing, it’s much longer than a lot of our other picks which allows for broad swings and added momentum. It’s made of hard, durable forged steel and perfectly balanced. The grip is really great, too, it has shock reduction technology so you can use it for long periods of time without soreness in your hands or arms. The handle is made out of nylon vinyl and has a deep cushion grip that’s bonded to the steel tang. It comes with a heavy duty ballistic nylon sheath to protect the blade. Plus, you can easily attach it to your belt. The blade comes to you hand sharpened and polished, proudly made in the USA. Our pick for best lightweight backpacking axe is this BladeMate Survival Hatchet. The black stainless steel blade is razor sharp and super durable. Black stainless steel is simply stainless steel with a polymer coating so you get added protection against rust, corrosion, and the elements, just what you need when you’re going camping or backpacking. The rubber handle is ergonomically designed and has a really great grip that gives you a lot of control. It comes with a durable nylon sheath to protect the blade that attaches to your belt if you want to carry it with you during your outdoor adventures. That’s not all, BladeMate is an awesome company that really stand by their product. This axe comes with a lifetime guarantee and the company donates 10% of their profits to the Wounded Warrior Project. 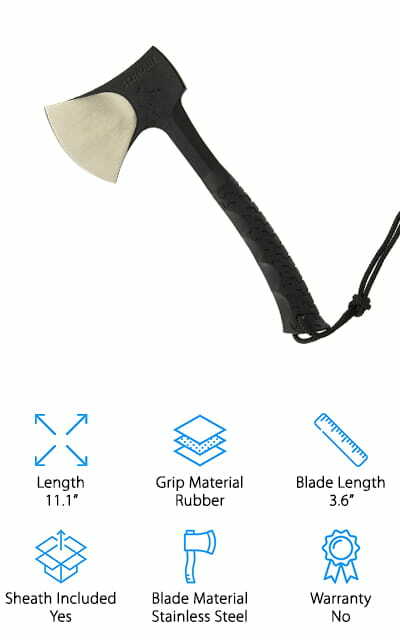 Our next pick for best backpacking axe for sale is the Oak Curve Outfitters Camp Axe. 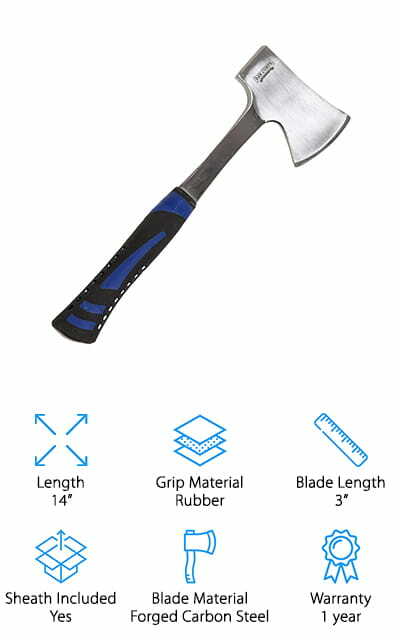 The 100% forged carbon steel blade can chop and split firewood quickly. Plus, the back end of the blade can be used as a hammer when you need help with tent and tarp stakes. The rubber handle provides all weather shock resistance and is ergonomically designed for comfortable extended use. It’s made of 1 piece of metal and has a full tang which gives it strength and durability. 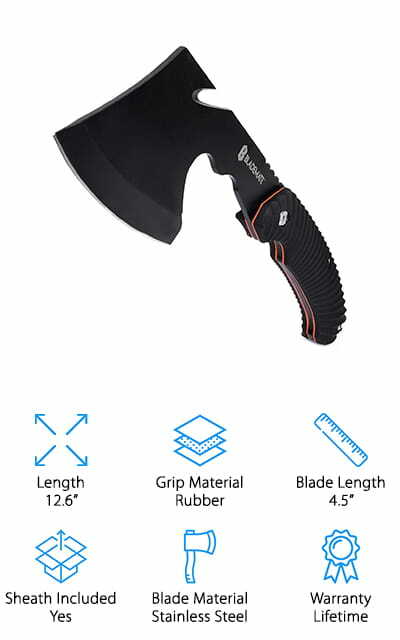 This axe comes with a nylon sheath to protect the blade when not in use. It even has a belt loop so your axe will be right there when you need it. One more thing, it includes a 30 day money-back guarantee as well as a 1 year replacement warranty. Last but not least is this cool looking axe from 1844 Helko Werk. This hatchet was handmade in Germany and looks like a collector’s piece. But don’t worry, it’s an extremely effective tool and a good choice for any outdoor adventure. 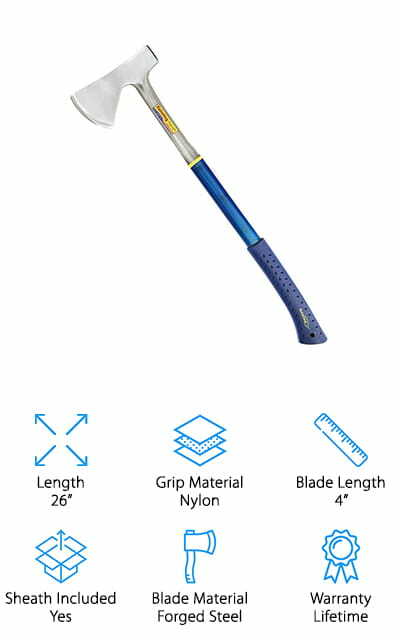 This compact, lightweight axe is made from high grade carbon steel that’s super durable and holds an edge very well. The back side of the blade can also be used as a hammer. The handle on this one is special. It’s made of American hickory that’s sustainably sourced. It’s sanded smooth and given a boiled linseed oil finish to seal it. This ax comes with a vegetable-tanned leather sheath with stylish large silver rivets and a buckle to keep it in place. It protects the blade when not in use and, honestly, just looks really awesome. 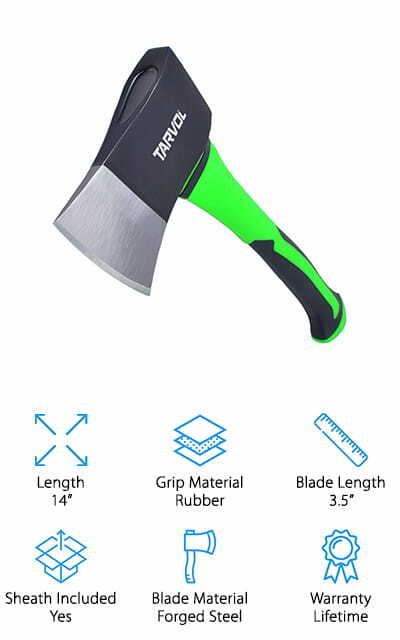 The Tarvol Camping Axe is up next in our backpacking axe reviews. Something that makes this one special is the blade. It’s made of forged carbon strength steel and balanced for the perfect power to weight ratio. This axe weighs just under 2 pounds which makes it heavy enough to chop well but not so heavy that it’s a burden to carry. That’s not all, the back end of the blade can also be used as a hammer so this is really 2 tools in 1. As for the handle, it’s made of rubber and has a great grip and a smooth finish. It’s comfortable while still allowing you to have a lot of control over positioning. It’s black with a bright neon green accent which makes it really easy to spot when you need it.